Nicole has been a loyal sponsor of the AMOM blog for some time now, but this month, she has something special for all of us. She's sent me an AMAZING collection of her products from her Etsy store to give away to one lucky reader!! Included in the package are over 30 designs in a variety of sizes and colors. There 12x12 die cuts papers, large scrolls, frames, smaller embellishments (most of the smaller items include two within the package) and even a couple of her new rhinestone designs! 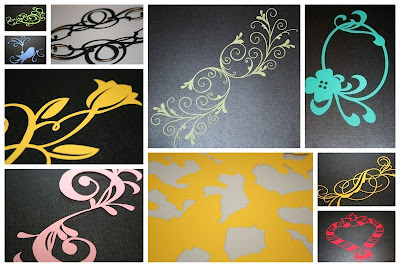 There are an endless number of ways to use these die cuts to enhance your scrapbooking projects! Would you like a chance to win this beautiful collection? Simply leave a comment to this post by 5 p.m. on Thursday, February 3rd, 2011 and you'll be entered for your chance to win this package of Nicole's lovely die-cut designs.